Rula is a Falco main from South Florida with a very aggressive but reckless play style, but for the most part, is very effective in overcoming his opponents. He's known as EbAgItachi on SmashBoards. Rula formerly held the 8thplace ranking on the Central Florida Melee Power Rankings. Rula first joined competitive Smash around 2011. He was an avid FPS gamer but, as Halo 2 servers were having less and less players on them, he found himself wanting to get into a different aspect of competitive gaming. Soon he watched the infamous match between Mew2King and DaShizWiz during Revival of Melee, and seeing the speed and tech skill attracted him more than ever into the Melee scene. 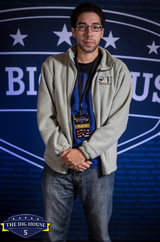 As of late, he has traveled to various tournaments, but is probably most known for his match against KoopaTroopa895 at EVO 2014, which was a close set that ended with Rula being sent into losers' bracket of his pool. Later on, the two met again in losers' semis of the pool, and Rula convincingly won 2-0. He then defeated Quaff in losers' finals of the pool to make it out through losers', and was eliminated by FullMetal, placing 97th overall out of a total of 970 entrants. At CEO 2015 he is known for taking the first game of his set with Leffen before Leffen got a 2 game comeback. This page was last edited on February 4, 2018, at 01:48.